Specially formulated for onions, shallots and garlic as well as autumn and spring planting flower bulbs. 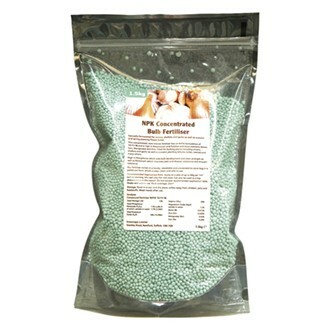 This concentrated, slow release fertiliser has an N:P:K formulation of 12:11:18 and is high in Magnesium and Sulphur and trace elements Boron, Iron, Manganese and Zinc. Ideal for bulbing plants including onions, shallots and garlic as well as autumn and spring planting bulbs like alliums, tulips, narcissi, lilies, gladioli and many others. High in Phosphorus which aids bulb development and stem strength as well as Potassium which improves pest and disease resistance and drought tolerance. Our fertiliser comes in a handy, resalable and convenient to store bag in a granulated form, which is easy, clean and safe to use. Recommended Application Rate: Apply at a rate of 60gm per square meter before planting. Mix well into the root zone. Can also be used as a top dressing later in the season. Shake well before use. Precautions: Do not exceed recommended application rates. Storage: Store in a cool and dry place, safely away from children, pets and foodstuffs. Avoid contact with the skin. Wash hands after handling.